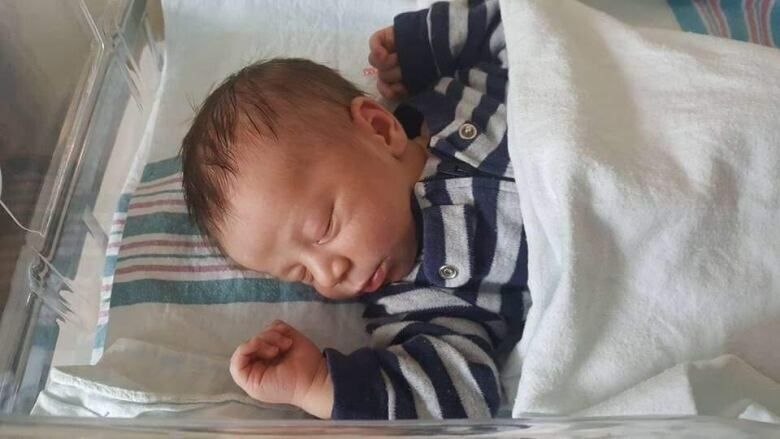 A mother and father whose newborn was unexpectedly delivered Friday in the washroom of a Halifax grocery store have been gifted a year's worth of diapers. 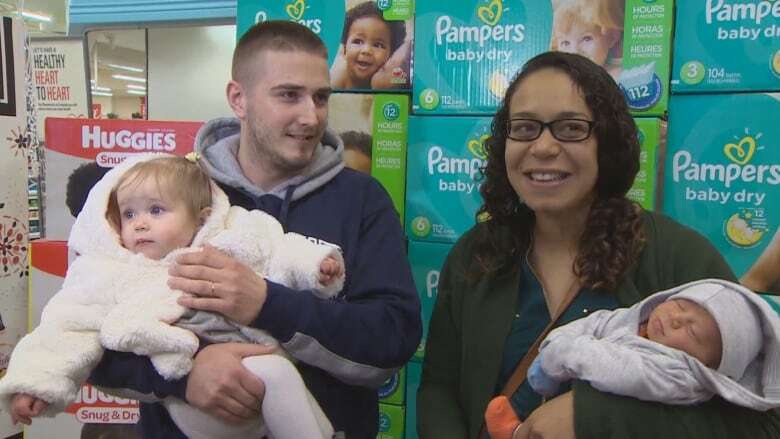 A mother and father whose newborn was unexpectedly delivered Friday in the washroom of a Halifax grocery store has been gifted a year's worth of diapers from the shop. Ashleigh Miller-Cross and her husband, Kyle Cross, returned to the Atlantic Superstore in Bayers Lake on Monday with their daughter, Mia, and newest addition, Ezra, in tow. It wasn't just the unconventional location that makes Ezra's birth story stand out. Miller-Cross, just 10 months postpartum with Mia, didn't realize she was expecting again. "I really had no idea," she told reporters. "I presumed I hadn't lost any weight because I only had Mia 10 months ago.... I didn't grow any extra. I was just the same size. I didn't have any cravings." Ezra was born with the help of the store's assistant manager, Malcolm Comeau, and another employee. Comeau has said he was in his office Friday when he heard a woman screaming in the washroom. "I opened the door and Ashleigh was there and the baby was halfway out," he said Monday. "She just screamed at me, 'I'm having a baby!' and I automatically grabbed my phone and dialed 911." Comeau said helping deliver a baby was a first for him and, as far as he knew, a first for the store. "It's like some other instincts take over. You just don't think about anything else. It's like, get help and do whatever you can." Another store employee heard what was happening and jumped in to help. "I peeked back in, the baby had been born. He was fine. He was breathing," said Comeau, who ran down to a medical clinic located within the store to get a doctor's attention. The family said the last few days have been hectic, overwhelming and happy. "I'm just thankful my mom was here," Miller-Cross said. She said the diaper donation will go a long way to help the new family of four. "I want to thank everybody who has offered support, everyone who was giving us things," said Miller-Cross. "I especially want to thank Malcolm [Comeau], the lady who helped me in the bathroom straight away. She was right there with me. Just everyone. The staff at the IWK and also the paramedics who came and helped me."